For those of us ancient enough to remember early ’70s TV shows, the number 222 triggers certain memories. For me, it rekindles the adolescent lust I had for Karen Valentine, the actress who played idealistic English teacher Alice Johnson on ABC’s Room 222. The comedy-drama, set in Los Angeles’ fictional Walt Whitman High School, had an African-American star (Lloyd Haynes) and dealt with the prevailing issues of the day, such as the Vietnam War, women’s liberation, race relations and Watergate. And so, whenever I walk by Salt Lake City’s Bistro 222, I fondly recall Valentine and others actors that I first saw on that show: Cindy Williams, Bruno Kirby, Ed Begley Jr., Dabney Coleman and others. A while back, I reviewed Boulevard Bistro (1414 S. Foothill Drive, 801-953-1270, BoulevardBistroFoothill.com), an eatery I liked very much. Well, the same owners bring us Bistro 222, as well as the newly opened Salt Flats Grill & Tap Room (formerly Sonny Bryan’s Smokehouse) next door. 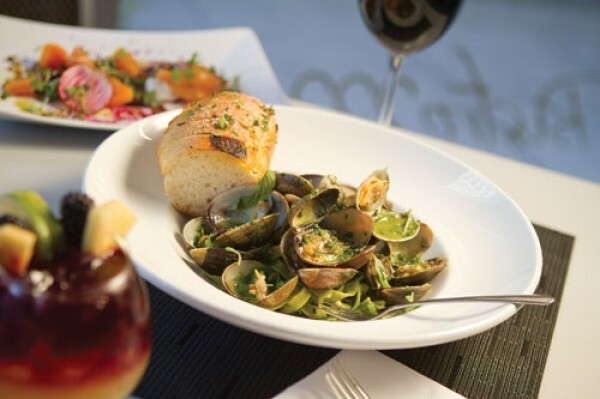 Like its sister restaurants Boulevard Bistro and Toscano Italian Bistro in Sandy, Bistro 222 is quite fetching. All of the Equiwest Hospitality Group’s restaurants are contemporary, but also warm and inviting, and Bistro 222 has a modern, urban vibe that’s perfect for the “new” downtown Salt Lake City. The restaurant is also LEED (Leadership in Energy & Environmental Design)-certified, meaning it has passed a green-building program that recognizes best-in-class building strategies and practices. Our first visit started out a bit rocky: I was confused by the menus until I realized we’d been given lunch menus at dinner. No harm, no foul. Our friendly and efficient server, Tony, quickly remedied the situation with an apology. To be fair, we dined early and were the first dinner customers, so the lunch and dinner menus hadn’t yet been switched out at the host stand. I like that executive chef James Buonforte isn’t tackling too much. The dinner menu is manageable: a trio of pastas, a salad quartet, a quintet of appetizers and a sextet of entrees, plus a few pizzas and sides. The fried calamari ($10) is a good place to start. Adults and kids alike at our table loved the lightly battered, almost tempura-like squid rings and tentacles, deep-fried to a light golden crunch, tossed with pickled onion slices and arugula, and served with housemade herb aioli. For flavors a bit more exotic, try the Moroccan lamb meatballs ($10) with pickled fennel and an olive oil and yogurt emulsion. Kids at Bistro 222, not surprisingly, will veer toward the Napoli-style wood-oven pizzas. My son Hank is a Margherita pizza aficionado, and fully approved of Bistro 222’s Margherita ($12). The beautiful crispy crust, quality tomato sauce, fresh mozzarella and basil leaves met my approval as well. Jeremy—normally a pepperoni-pizza guy—opted for a tomato-sauce-free pizza with housemade ricotta, fresh mozzarella, smoked Gouda, thin-sliced Creminelli prosciutto and fresh arugula. It, too, was outstanding. But if you want to really go big, I suggest The Hangover ($15). It’s that same, high-quality, wood-fired crust topped with ricotta, mozzarella, smoked Gouda, Creminelli pancetta and—here’s the kicker—a roasted egg on top. Bistro 222 sports a well-selected wine list of about 120 bottles, with a dozen or so available by the glass. I was particularly impressed with how much our youngish server new about the wines on the list. The prices are fair, and we chose a $25 bottle of Alamos Torrontes from Argentina to accompany dinner. Should you decide to splurge, however, you could spring for a $600 bottle of 1998 Jordan Cabernet Sauvignon or the 1993 Silver Oak vintage for $500. Those last two wines would be gangbusters with wild-mushroom and crÃ¨me-fraÃ®che lamb osso buco, falling off the bone and served on a bed of thick pappardelle pasta ($22). Ditto the 12-ounce rib eye ($39), with a miso-garlic rub, spring veggies and lemon-scented fingerling potatoes. I should note that Bistro 222 lunch prices are drastically lower than dinner: $14 for the lamb osso buco vs. $22 at dinner; $12 for the fettuccine with clams vs. $20, and so on. So if you’re on a budget, try lunch first.